Most African sculpture was historically in wood and other organic materials that have not survived from earlier than at most a few centuries ago; older pottery figures are found from a number of areas. Masks are important elements in the art of many peoples, along with human figures, often highly stylized. 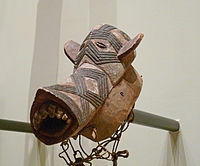 There is a vast variety of styles, often varying within the same context of origin depending on the use of the object, but wide regional trends are apparent; sculpture is most common among "groups of settled cultivators in the areas drained by the Niger and Congo rivers" in West Africa. 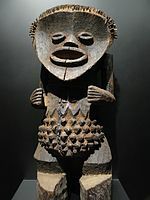 Direct images of deities are relatively infrequent, but masks in particular are or were often made for religious ceremonies; today many are made for tourists as "airport art". African masks were an influence on European Modernist art, which was inspired by their lack of concern for naturalistic depiction. The Nubian Kingdom of Kush in modern Sudan was in close and often hostile contact with Egypt, and produced monumental sculpture mostly derivative of styles to the north. In West Africa, the earliest known sculptures are from the Nok culture which thrived between 500 BC and 500 AD in modern Nigeria, with clay figures typically with elongated bodies and angular shapes. Later West African cultures developed bronze casting for reliefs to decorate palaces like the famous Benin Bronzes, and very fine naturalistic royal heads from around the Yoruba town of Ife in terracotta and metal from the 12th to the 14th centuries. Akan goldweights are a form of small metal sculptures produced over the period 1400–1900, some apparently representing proverbs and so with a narrative element rare in African sculpture, and royal regalia included impressive gold sculptured elements. Eastern Africans are not known for their sculpture, but one style from the region is pole sculptures, carved in human shapes and decorated with geometric forms, while the tops are carved with figures of animals, people, and various objects. These poles are, then, placed next to graves and are associated with death and the ancestral world. The culture known from Great Zimbabwe left more impressive buildings than sculpture but the eight soapstone Zimbabwe Birds appear to have had a special significance and were mounted on monoliths. Modern Zimbabwean sculptors in soapstone have achieved considerable international success. Southern Africa's oldest known clay figures date from 400 to 600 AD and have cylindrical heads with a mixture of human and animal features. Mbangu mask; wood, pigment & fibres; height: 27 cm; by Pende people; Royal Museum for Central Africa (Tervuren, Belgium). Representing a disturbed man, the hooded v-looking eyes and the mask's artistic elements – facd surfaces, distored features, and divided colour – evoke the experience of personal inner conflict. Picasso copied a mirror image of this Pende mask in "Les Demoiselles d'Avignon"
^ Breunig, P. 2015. Nok. African Sculpture in Archaeological Context. Africa Magna, Frankfurt a. M.
^ Smith, David. "British Museum may seek loan of the golden rhinoceros of Mapungubwe". The Guardian. Guardian News and Media Limited. Retrieved 13 August 2016. ^ York, Geoffrey. "The return of the Golden Rhino". The Globe and Mail. The Globe and Mail Inc. Retrieved 13 August 2016. ^ Meyerowitz, Eva L. R. (1943). "Ancient Bronzes in the Royal Palace at Benin". The Burlington Magazine for Connoisseurs. The Burlington Magazine Publications, Ltd. 83 (487): 248–253. JSTOR 868735. Ezra, Kate (1988). Art of the Dogon: selections from the Lester Wunderman collection. New York: The Metropolitan Museum of Art. ISBN 978-0870995071. LaGamma, Alisa (2003). Genesis: ideas of origin in African sculpture. New York: The Metropolitan Museum of Art. ISBN 978-0300096873. Roese, Herbert E (2011). African Wood Carvings, the sculptural art of West Africa. CARECK. ISBN 978-0-9560294-2-3. Wikimedia Commons has media related to Art of Africa.